If ordering single or multiple copies, note the “Quantity” column in your PayPal Shopping Cart. 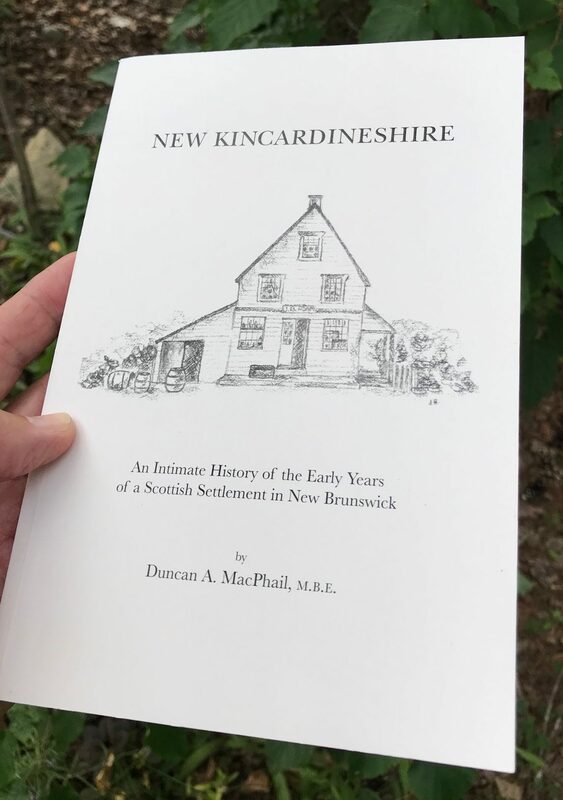 New Kincardineshire: An Intimate History of the Early Years of a Scottish Settlement in New Brunswick, by Duncan Archibald MacPhail, MBE. 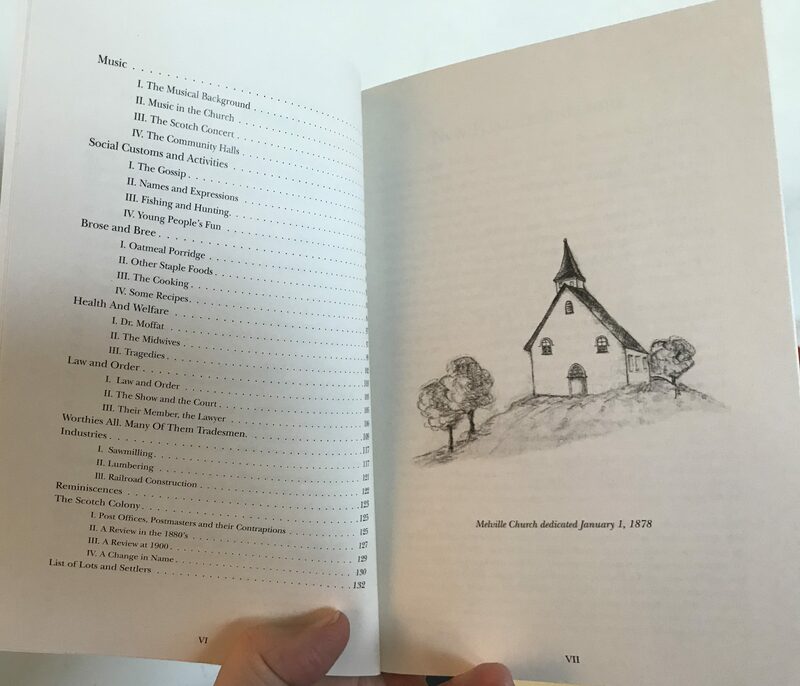 is a newly reprinted editon, 135 pages with several illustrations and tables. Originally published in 1977, this entertaining history of the Scotch Colony has been out of print for many years. Used copies are commanding high prices. (Harry E Bagley Books Ltd in Fredericton may have some first edition copies.) This perfect bound book is great reading for all of our Colony cousins. We have tracked down Peter and Susan MacPhail, the children of the author, and been granted permission to reprint this second edition. 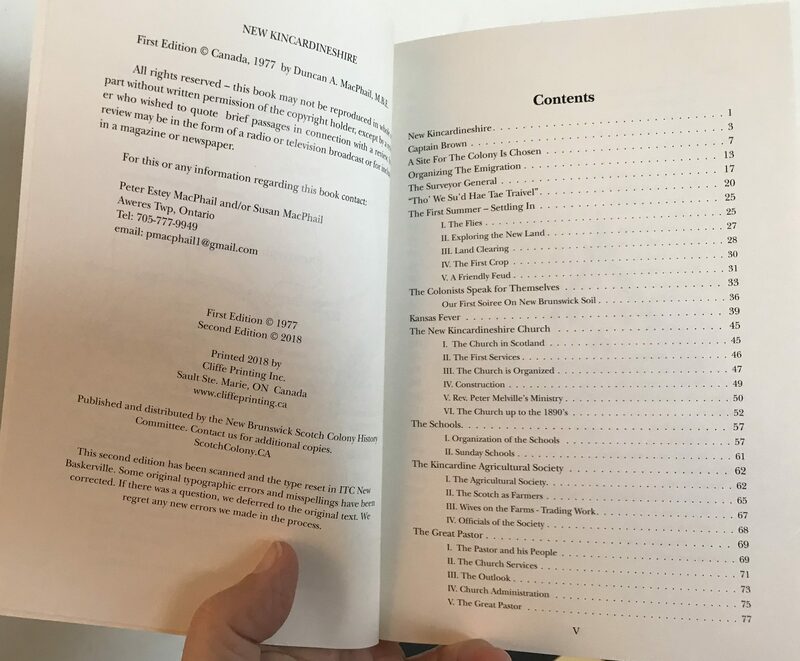 “New Kincardineshire” Table of Contents. Born in Kincardine, New Brunswick, on June 20, 1909, Duncan Archibald MacPhail grew up in the region about which this book is written. He attended school in Bon Accord and Andover and eventually Mount Allison University. Duncan married Jean Estey from Wicklow, N.B., in 1939. He spent the war years overseas, rising to the rank of Major in the Canadian Army Forestry Corps and being awarded an MBE for his service. Following his return home in 1945 the couple had two children, Susan and Peter. After the war Duncan worked two years helping organize the Maritime Forest Rangers School in Fredericton. He spent the rest of his career in Quebec, working in the woodlands division of the Canadian International Paper Company. Duncan and Jean eventually retired in Ottawa in 1972. Duncan always loved to read and write, so upon his retirement it seemed natural to begin researching the history of the Scottish Settlement of his ancestors, among the early pioneers of the Kincardine area. Eventually, in 1977, Duncan published the book New Kincardineshire. The fact that this book, a second edition of his original, is now being published would have given him a long, satisfied smile. Thanks to Peter and Susan MacPhail, and the family members who helped track them down, for making this book available again. Also available from our committee members (click here to go to our contact page). This entry was posted in Gifts and Souvenirs, News by Bill Duncan. Bookmark the permalink.